Can Iran’s Islamic Republic No Longer Depend on Its Diehard Backers? 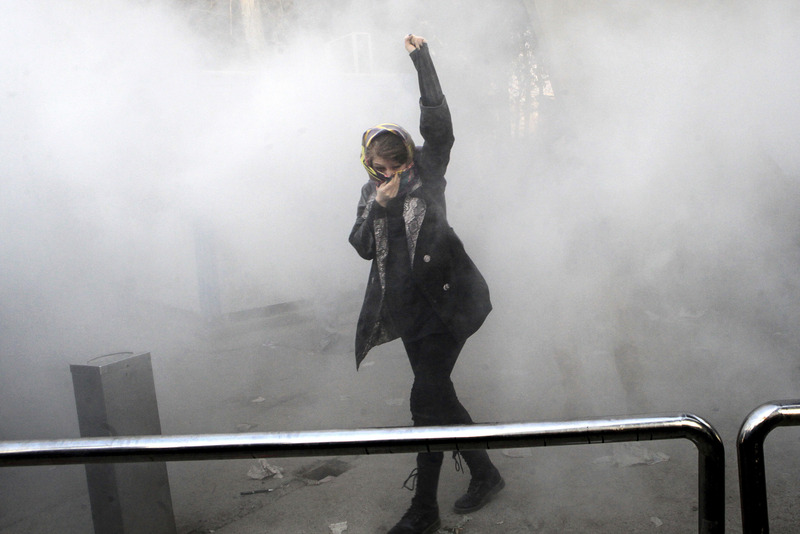 A university student attends a protest inside Tehran University. Photo courtesy of Associated Press. In the early weeks of 2018, protests swept through the small towns of Iran, mobilizing angry voices among the disgruntled lower rung of society. Demonstrators marched in the streets and assembled in major squares, chanting slogans against the country’s theocracy. Meanwhile, large cities, where some of the largest anti-regime demonstrations previously had taken place, remained relatively quiet. Though this year’s demonstrations have received less global coverage than earlier ones, this latest round may well be more significant: They show support for the government crumbling in the rural, poor base that made the revolution possible and has allowed its adherents to stay securely in power ever since. As a correspondent for The New York Times, I covered dozens of anti-regime protests since the late 1990s in large cities around the country. They became an outlet for people to express their frustration at the regime’s oppressive policies. Over the years, the demonstrations became bigger, culminating in the massive protests of 2009, when hundreds of thousands of people marched in the streets for six months over what they believed was an election stolen by then-President Mahmoud Ahamdinejad. In response, the government deployed loyal supporters from rural areas, equipping them with clubs and truncheons to beat the protesters. In 2009, some of the fighters looked so provincial that rumors spread they were mercenaries, especially because of the violence they used against demonstrators. Nearly 100 protesters were killed. That year, I was forced to leave the country after my house came under surveillance and I received death threats for covering the unrest. Over the last few months, the protesters I’ve seen in video clips are angrier than the ones I encountered in large cities nine years ago. These new protesters, despite being better educated than their parents, remain unemployed. One source has told me that the youth in smaller towns are no longer drawn to the government militia force because of the notoriety that clung to it after the bloody crackdown of 2009. But the demonstrations quickly grew and moved to other cities, and targeted politicians as well. Calls were made for an end to the regime, and for the country’s supreme leader, Ayatollah Ali Khamenei, to step down. Angry protesters set fire to police stations and attacked paramilitary bases. Newspapers covered the protests and debated what triggered them. The local daily JavanSome 3,700 people were arrested, and at least 21 people were killed during demonstrations, including an 11-year-old boy. The reasons protesters gave for their anger included the rampant cronyism in the upper echelons of society, as well as stifling class inequality that has widened since the election of President Mahmoud Ahmadinejad in 2005. The 2015 lifting of economic sanctions with the West also has disappointed many people. Urban areas got a few benefits, but small towns had not witnessed the ripple effects of growth. Instead, the high unemployment rates, inflation, and corruption that began under President Ahmadinejad have lingered. This new younger movement, unlike previous demonstrations, appeared leaderless and without a clear agenda. But the protesters were equipped with smartphones and had the ability to organize and communicate with one another. Some 48 million Iranians (more than half the country’s population) have smartphones and are online. Technology helped the protests spread quickly to almost every province, including some 100 cities and remote areas, where protests against the state had not been seen since 1979. When the next crisis comes, it’s not clear the regime will be able to depend on its once-diehard supporters. The protests emerged after President Hassan Rouhani released the details of his budget proposal for the Iranian fiscal year starting March 21. The budget envisioned steep cuts in cash subsidies to the poor, while increasing fees for foreign travel and services like vehicle registration. In a canny move, he also made public the amount of funding allocated to Iran’s wealthy religious foundations—as well as its powerful military and the paramilitary forces loyal to the regime. Rouhani said it was a step forward for transparency, but the revelations went viral on social media and angered many Iranians. The disclosure of an $8 billion budget for the Revolutionary Guard Corps, Iran’s most influential security force, prompted sharp criticism from protesters. They objected to government spending on Iranian involvement in regional wars, including those in Iraq and Syria, instead of funding projects that could create jobs at home. Religious foundations, many of which are tax-exempt, also got a boost in the new budget, including a 20 percent increase for representatives of the supreme leader who are posted at Iran’s universities. These organizations, which are under the direct supervision of Khamenei’s office, are also linked to some of the financial institutions that have announced bankruptcy over the last year and depleted Iranians’ savings, sparking public rage. While the supreme leader, Ayatollah Khamenei, who was the target of the most hateful slogans, blamed the protests on “enemies” (a reference to the United States and Israel), President Rouhani acknowledged young people were unhappy about far more than just the economy. “It would be a misrepresentation (of events) and also an insult to Iranian people to say they only had economic demands,” Rouhani said. “People had economic, political and social demands,” a reference to the pressures his political opponents impose to keep their grip on society. The government launched a clampdown in large cities, arresting hundreds of activists, including a group of environmentalists. One university professor, Kavous Seyed-Emami, was said to have died in prison. Authorities claimed that he committed suicide, but did not permit an independent autopsy, spurring speculation about torture. Four others have died in custody over the last three months. But in smaller towns, the regime has refrained from deploying its fearsome paramilitary troops that are commonly used to repress protests. Isolated clashes between police and protesters have broken out, but there was no evidence to suggest a comprehensive effort to end the protest movement by force. The Revolutionary Guard, the country’s elite armed forces, largely stayed away from these areas, perhaps to avoid further alienating the residents. Though these demonstrations seem unlikely to pose an existential threat to the established order, they will shift perceptions of the country’s grassroots. In times of adversity, the Islamic Republic has always banked on the enthusiastic support of the working classes. When the next crisis comes, it’s not clear the regime will be able to depend on its once-diehard supporters. It might have to start addressing popular demands rather than crushing them. Nazila Fathi is a former Tehran correspondent for The New York Times and the author of The Lonely War: One Woman's Account of the Struggle for Modern Iran.